Johnny Fuller was born in Mississippi and grew up in Vallejo, California, a transplanted bluesman with a fondness for country music. In 1955, the 26-year-old made his first record for the Hollywood label, "Train Train Blues" (as down-south a blues number as you would expect from anyone on the west coast), penned by Robert Geddins, a Texas-born writer and producer based in the San Francisco area (a singer in his own right who at one point recorded as The Mystery Man). The two worked together frequently over the next few years; Fuller recorded a couple of singles for the Aladdin label including "Johnny Ace's Last Letter" (eerily suggesting a possible reason for the singer's death) in addition to releases on Flair and Imperial (most notably "Don't Slam That Door" in '56, under the auspices of Dave Bartholomew). In 1958 he recorded Geddins' "All Night Long" for Checker, revealing his aforementioned C&W leanings. Fuller's best-known song came during a brief stint at Specialty Records: "Haunted House," an early 1959 release, ventured into scary territory. The rockin' R&B tune, another Bob Geddins creation, opened (and closed) with an ominous, ghostly laugh, Fuller declaring 'I just moved in my new house today...movin' was rough but I got squared away...when chains started ringin' and bells ringin' loud...I knew I'd moved in a haunted house!' Some hot chicken-pickin' guitar work kept the song driving along: '...I saw somethin' that give me the creeps...had one big eye and two big feet...I stopped right still and I did the freeze...he did the stroll right up to me,' incorporating two of the popular dance trends of the time. Fuller's record is a pure delight, one of the top tunes for Halloween play, but I'm all for slapping the single on the turntable any time of the year. It was a minor hit at best, but gained enough attention to get Johnny booked on a few rock and roll tours. His recording career faded in the '60s and he eventually gave it up to work a steady job as an auto mechanic. 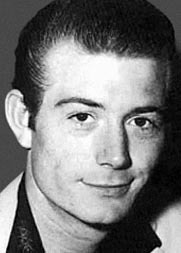 While Johnny Fuller was getting his career under way, a young singer from Tupelo, Mississipi, had started a band and was trying to get a foothold in the music business. Gene Simmons met fellow Tupelo boy Elvis Presley while visiting a friend in Memphis sometime in 1954. He thought Elvis was an odd cat but reconsidered that first impression some months later after hearing "That's All Right" on the radio and realizing who it was. Asking around, he was able to make contact with Presley's manager Bob Neal, which led to a one-shot gig backing Elvis, Scotty and Bill at a Tupelo show. Elvis helped set him up with Sam Phillips for an audition at Sun, but Phillips wasn't interested. Eventually, through perseverance combined with considerable improvement in his own musicianship, he persuaded Sam to let him record several songs for Sun. Only one record was released by the label, though, in 1958. "Drinkin' Wine" was a confidently rockin' track, revealing a swagger both spoken and sung. Why there were no follow-up singles is a mystery...but then, Sam Phillips worked in mysterious ways. Gene moved from label to label, laying down sides for Judd and Argo in 1959, sometimes going by the name Morris Simmons. One-off 45s for the Sandy and Checker labels appeared in 1960, then he found a more promising situation with Hi Records. Started in 1957 by several former Sun employees, the Memphis-based company's first success had come in '59 with Bill Black's Combo, an instrumental trio led by Presley's former bassist. Gene's debut for the label was a remake of the 1957 Carl Perkins hit "Your True Love," followed by a couple of other singles released about six months apart. Leaving Hi and returning to his home town in 1963, he put out a gimmicky dance tune, "Hop Scotch," on his own label, Tupelo Records. Ray Harris at Hi Records heard the track and approached Sam the Sham about rerecording it (running well over three minutes, Harris wanted the guitar break eliminated and felt the arrangement could be "punched-up" a bit to get it down to a more radio-friendly two-and-a-half minutes or so). Sam refused, so they asked Gene to give it a try. 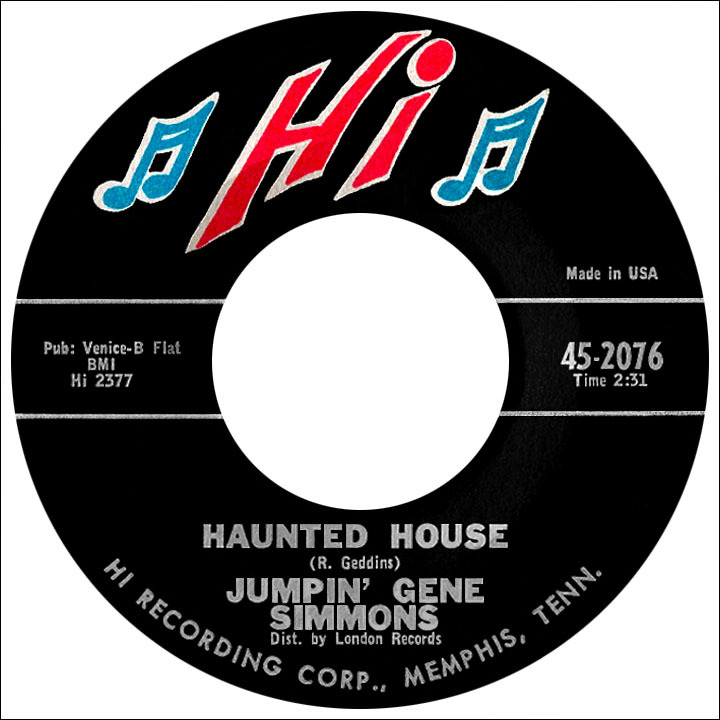 The take of "Haunted House" by Jumpin' Gene Simmons was indeed more economical while the lyrics remained reasonably intact: 'He ate the raw meat right from my hand...drank-a hot grease from the fryin' pan...said to me now you better run...AND DON'T BE HERE WHEN THE MORNIN' COMES!' Gene's was the version that caught on. Hitting the national charts in August 1964, it peaked at number eleven on both the Billboard and Cash Box charts a few weeks before Halloween...nice timing! The proud declaration of Johnny Fuller, Sam the Sham and Jumpin' Gene, quoting Bob Geddins from the final stanza of "Haunted House," had now been heard by millions: 'Say yes I'll be here when the mornin' comes...I'll be right here and I ain't gonna run! I bought this house, now you know I'm boss...ain't no haint gonna run me off!' One bizarre record begat another and Gene's follow-up, "The Dodo," had a brief chart life, but at least avoided extinction (unlike the song's subject). Hi released two more Simmons singles including "Keep That Meat in the Pan," a suggestive double-entendre number inspired by the lyrics of "Haunted House." Maturity must have finally set in when he left the Hi label soon afterward; at that point he dumped the "Jumpin'" part of his name. One particular Israeli-born gentleman by the name of Chaim Witz, who moved to the U.S. as a child, was a fan of Gene's rock and roll singles, having discovered his work after hearing the singer's big 1964 hit. In the 1970s, when Witz formed his own band, Kiss, he decided to take the professional name Gene Simmons, and it's been associated with the blood-spewing "Demon" ever since. As for the former "Jumpin'" Gene, he spent the remainder of his career in country music, where he claimed his heart had been all along. Sporadic record releases appeared and his songs were recorded by a number of country acts. The most successful of these was "Indian Outlaw," cowritten with Tommy Barnes, which became a breakthrough country and pop hit for Tim McGraw, one of the most popular singers of recent years.